Scientists from the German Cancer Research Center (DKFZ) have now used a new gene technology method called CRISPR/Cas9 technology for this detection. Using this method, they were able to turn off specific tumor suppressor genes in the brains of mice and prove that this loss leads to the onset of brain cancer. As a result, scientists now have a comparatively simple method for examining cancer-promoting genetic defects. Analysis of a tumor genome is an important source of information for clinicians trying to identify changes in the cell that might promote the development of cancer or fuel cancer growth. During their analysis, researchers frequently come across changes in the tumor genome. Oftentimes, the exact significance of these changes with regard to cell function is still unknown. “If we suspect that a particular mutation promotes cancer, we ultimately have to prove this in a living organism,” says Dr. Jan Gronych from the German Cancer Research Center (Deutsches Krebsforschungszentrum, DKFZ). Obtaining this kind of experimental proof often takes a tremendous amount of time and work. Usually, it is first necessary to breed mice that carry the mutation in the genome of all cells. Researchers will then use these animals to investigate tumor development. “Such experiments can take years,” Gronych explains. Among the most labor-intensive efforts are those that aim to detect the effects of mutations in “cancer brakes” called tumor suppressor genes. CRISPR/Cas9 technology is a new method that has revolutionized gene technology in recent years and is used to target and turn off specific genes. With this method, scientists use RNA probes that guide an enzyme specifically to a selected gene. The gene is then destroyed by the enzyme. Gronych and his colleagues, Marc Zuckermann and Dr. Daisuke Kawauchi, employed this method with the hopes of simplifying their approach to studying the impact of losing specific tumor suppressor genes. They have now been able to selectively destroy individual cancer brakes in the brains of mice and to investigate the brain tumors that have developed as a result. As a model for their studies, the researchers chose two types of cancer with known molecular causes. 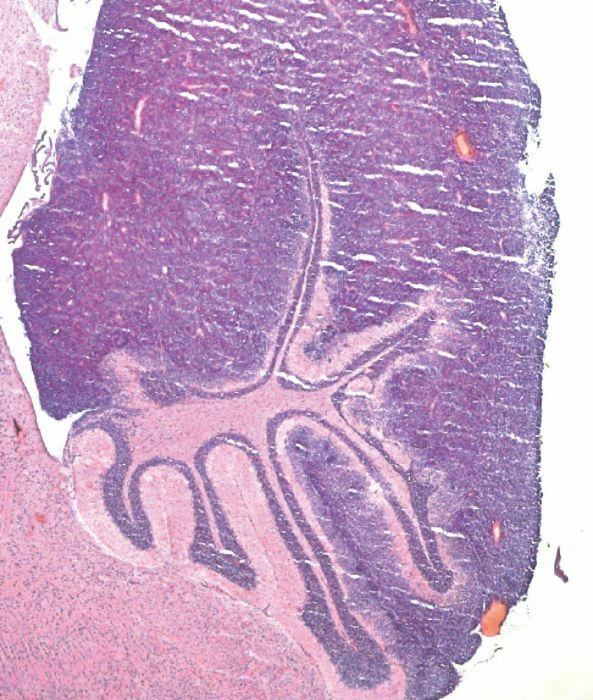 Mutations that lead to the destruction of the Ptch1 tumor suppressor gene in cells of the cerebellum very frequently induce a specific type of medulloblastoma. In a second, more complex approach, the researchers used the CRISPR/Cas9 constructs to target three known tumor suppressor genes (P53, PTEN and NF1) all at once. Simultaneous loss of all three cancer brakes has frequently been observed in cases of glioblastoma. For these studies, the researchers introduced the CRISPR/Cas9 constructs directly into the brains of mice. Mice that had received this treatment in fact developed medulloblastomas and glioblastomas, respectively, with varying frequency depending on the method that was used. The structure of the resulting tumor tissue resembled that of human cancer. Sequencing of the tumor genomes confirmed in all cases that the CRISPR/Cas9 method had effectively eliminated the targeted suppressor genes. On the other hand, the researchers did not observe any repeated DNA damage outside of the target sequences, which has often been reported with the CRISPR/Cas9 method.